Coach Bainter played Quarterback/Free Safety for Evergreen High School in Seattle. His high school honors include being named 1st Team All-NPSL Quarterback/Defensive Back, team Captain and Most Valuable Player. Tom went on to play college football at Western Washington University as a Free Safety/ Defensive Back where he was a 4-year letter winner. 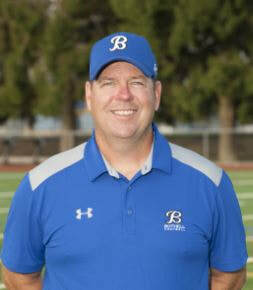 The 2018 marked the 19th season for Coach Bainter as Head Coach at Bothell High, and his 29th year of coaching. He teaches health at BHS. He finished the 2018 season with an overall record at Bothell High School of 170 wins and 53 losses. During his tenure he has led the team to six KINGCO Championships in ’02, ’03,’06’, ’07, ‘09 and 2014, three Crown Division Championships in ’08, ’09, and ’10 and a Crest Division Championship in 2012 and 2013. Bothell Football has qualified for the State playoff rounds 17 of 19 seasons with Coach Bainter at the helm, including eleven State Quarterfinal, three State Semi-final and three State Title game appearances. In 2014, Coach Bainter led his staff and team to the 4A State Title, compiling a 14-0 record and a top 25 National ranking. Did you know Coach Bainter...?
. . . was “Coaching 101” award-recipient in 2009 (WAC).
. . . coached Running Backs for the USA Junior National Football Team, summer 2009.
. . . was the Head Coach for the USA Football 15U National team, January 2015.
. . . was the Head Coach of the East-West All-Star game, summer 2008 and 2014, in Spokane.
. . . was named Seattle Seahawks High School Coach of the Week in the ‘00, ‘02, ’07, ‘09 and 2014 seasons.
. . . was named KINGCO Coach of the Year in ‘00, ‘02, ‘06 , ’07 and 2014.
. . . was named Running Back specialist for USA Football’s Health and Wellness Committee.
. . . led Team USA 16U along with Coach Jim Monson to victory at the 2016 International Bowl in Dallas Texas.
. . . is a National Master Trainer for Heads Up Football, training coaches across the country in concussion prevention awareness.